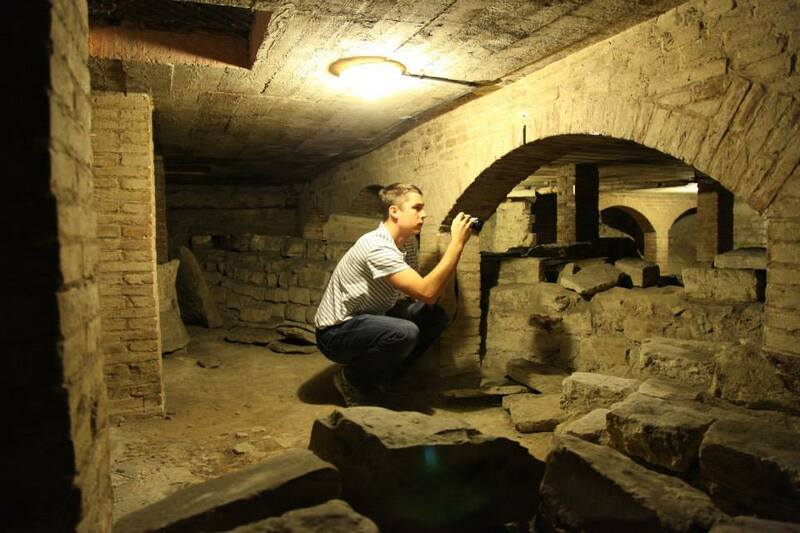 The familiar preface: The primary CISA3 field site in 2013 was the Baptistery of St. Giovanni, one of Florence’s most famous, venerated, and mysterious monuments. For our research goals see this. 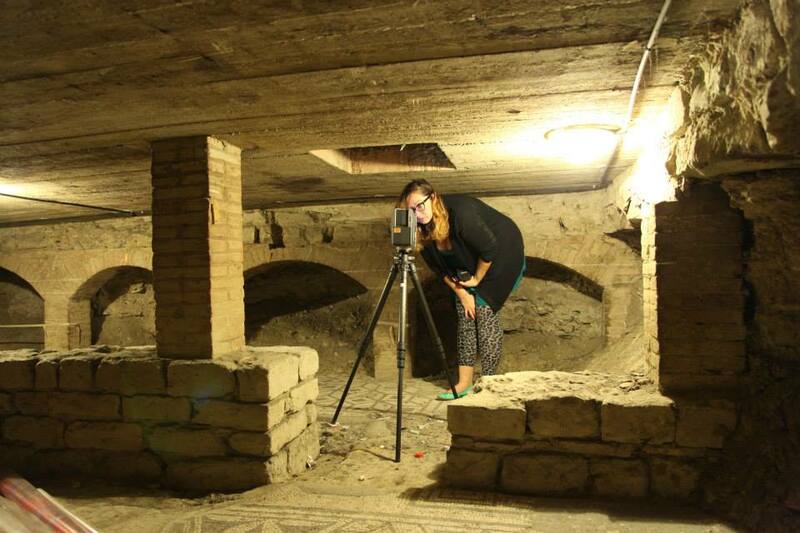 The Opera del Duomo di Santa Maria del Fiore (OPA) invited CISA3 researchers to join their interdisciplinary team of researchers working to establish a chronology of construction for the Florence Baptistery of St. Giovanni (John). The evolution of the site from its Roman origins upwards is rather mysterious. Significant research has been done by dedicated scholars, but they’ve no way to correlate that information altogether to start making sense of it. Enter the CISA3dream of layered realities of data visualization. As an observant tourist wandering through the Baptistery–you might notice the layers of upper balconies (the first floor of them is fairly obvious (though they seem a lot narrower from the ground than they are once you’re up there), and you might ponder the small square windows higher up that house lighting for that second tier of corridors encircling the domed roof, but often people fail to look down. Because half of the floor of the Baptistery’s main room has grates in it. And through those grates are glimpses of another floor below-one rarely visited (though there are high hopes for a future continuation of the excavations below) but often discussed as part of the urban legends surrounding the Baptistery. Underneath the medieval (+) Battistero are the controversial Roman layers. Reputed to be built over a Roman temple to Mars, there are definitive signs of an elite Roman villa-like something underneath there. Accessed via a wrought iron spiral staircase underneath one of the grates on the altar of the scarsella, the subterranean section is a mix of odd buttresses to hold up the floor, medieval aqueduct systems, and late Roman mosaics. The excavated below ground area extends almost to the center of the primary open space, where it encounters a wall, through which a smaller area has been uncovered that seemingly circles round an octagonal space that mirrors the central floor design above (possibly reinforcement for the original Medieval font of the Baptistery? (the giant one Dante infamously saved a baby from not long before they opted for a smaller, less prone to accidental-baby-drowning one. The pieces of the old font were later found in Florentine attics and church basements and now hang piecemeal in the Duomo Cathedral museum)). 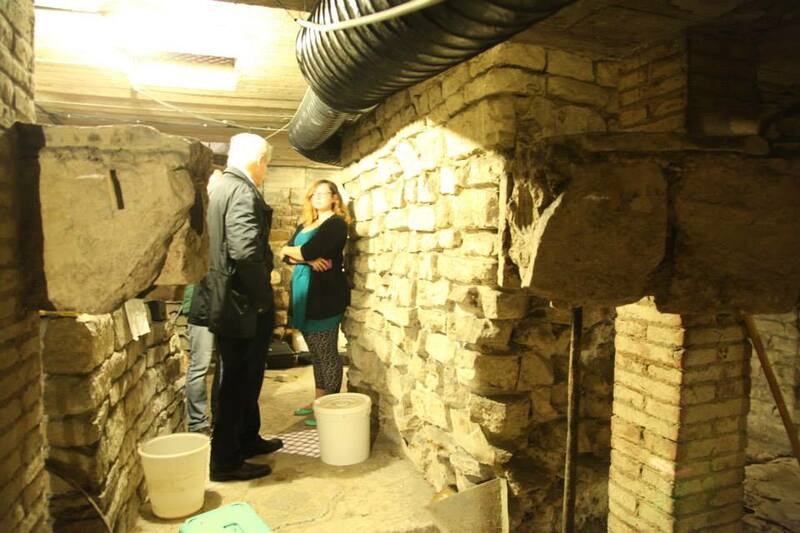 Having access to the subterranean and aerial (see next post) of the Baptistery were the big surprises of the season, and were also the biggest time crunched and restricted. We could only bring in a few people, so the team was cut down to a skeleton crew–myself, DV, Mike Hess, and Maurizio Seracini were the ones sent below. And so with only an hour of time allotted, we set to work to collect as much visual data as we could with the laser scanner and our cameras. Fabulously, however, the powers-that-be extended our time by the simple expedient of locking us in and having us continue working quietly throughout the morning service above. They let us out just after the services, and the few stragglers and incoming tourists were definitely well surprised to see us emerge from below the altar. With such a limited scanning time, some of the sections are sparsely covered and I would love to get back down there to flesh it out and strengthen the resolution of the model. But for conservation analyses purposes–its a more than sufficient digital scaffold for any further information that is collected from the site (fingers crossed Maurizio will one day get some GPR collected from down there). 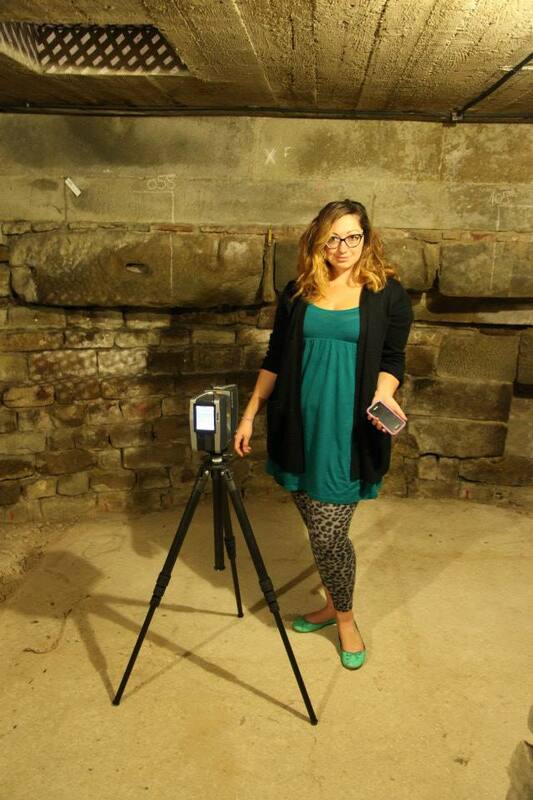 Ashley M. Richter and the Faro Focus 3D scanner setting up to image the subterranean levels of the Baptistery. Tagged archaeology, Architecture, art, Ashley M. Richter, Baptistery, Baptistery of San Giovanni, Baptistery of St. Giovanni, Baptistery of St. John, Battistero, Center of Interdisciplinary Science for Art Architecture and Archaeology, CISA3, computer science, Cultural Heritage, Cultural Heritage Diagnostics, cyberarchaeology, Digital, digital archaeology, engineering, Florence, laser scanning, Point Clouds, structure from motion, technology, University of California San Diego, Vid Petrovic, visualizationBookmark the permalink.